You’re concerned about your webinar content. Rightfully, you should be. However is the concern regarding the right thing? The numbers is one of the main reasons holding many back from fulfilling their dreams and hosting Webinars. You’ve heard the gurus and experts talk about how successful their webinars are and how they’re making 6-figures launching their programs in 24 hours or less. You got excited about the possibilities for your own business, but somewhere along the way you got stuck, fearful, concerned that what you were going to share on a Webinar is not useful to your community. You don’t know it for sure, you just think that. Let’s say you’ve been blogging weekly either once or twice for the last year and a half. You’ve gotten to know your community. You know who’ll reply to you via email or comment on the blog post itself. You know who will be the first to share your post on social media and add their own commentary to your article. You know who will tell you straight whether or not what you provided hit the spot or not because you know your community. Now this didn’t happen overnight. You started out unsure of yourself. Not sure what to say, you just knew there was something inside of you that kept drawing you back to your keyboard and before you knew it, your message came through right there on your page and you hit publish. Without a care in the world you went for it. At the beginning you had no concept of success or failure, you just knew there was a message deep inside and you wanted to get it out on your blog. You didn’t think about numbers, followers, retweets, shares, none of that. In fact, you didn’t concern yourself with any of that. You were proud that you published. Fast forward it’s 2015 and you’ve been following all the gurus and experts in your niche, those in the social media space, and Webinar world for who knows how long. You can rattle off their tips and information, however when you compare what’s been happening in your community to what’s happening on theirs you don’t find a match. The numbers aren’t adding up and because of that, you’re concerned about your content. You’re concerned that what you have to offer, no one wants because your numbers in comparison to the gurus looks like…. little to nothing. Is this right? Is this fair to your community? Let’s look on the flip side of this…. If I’m in your community, I’m no little nothing. I’m enjoying what you have to say. I’m showing up each time you post or opening your email each time you write. Maybe I’m one of those first adopters singing your praises and sharing on Twitter, Facebook, elsewhere online and offline. You’re thinking your numbers are nothing because they aren’t as high as the gurus and the experts. Your numbers might be in the triple, or double digits. Guess what? Each one of those digits represents a person. Imagine, those digits sitting in a room. How large of a room would you need in order to get everyone in it? Those numbers aren’t looking so little after all, not when you put everyone in a room together. Are you comfortable speaking in front of a live crowd in the triple digits or whatever digits your "little to nothing" numbers fall under? If you were to host a live event would you be excited about those digits? I’ll bet you would. In fact, your event would probably SELL OUT! Yes, 0. The beginning is not even at 1. Content is another reason that holds many back from fulfilling their dreams and hosting a Webinar. If your biggest question when I mention Webinars includes, what do you talk about it? I’m so glad you asked. The best place to get practice and develop content is on your blog and social media. Think of the Webinars you have attended. How many of those Webinars were hosted by someone you knew nothing about or had never heard of before you signed up for their event? More than likely, you either follow them on social media, subscribe to their email list or blog posts, heard them on a podcast, you were connected to them in some way. Before you start hosting virtual events, it’s a good idea to start creating some content. This is your time to test and see if others are interested in your content. If you are posting on a regular basis to your blog you’ll soon discover what your community responds to. You’ll find out what they are interested in and what they aren’t interested in. If you’re reading this, you have either a WordPress website or a Facebook Business Page if not both. They are your online space to develop your voice. It’s your stage to test what works and what doesn’t work. 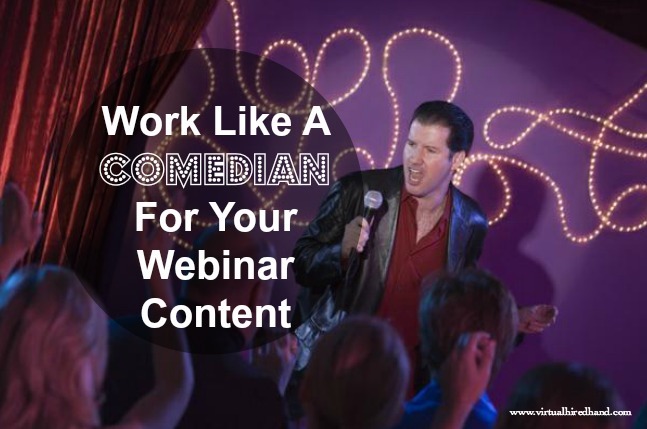 Treat your blog and social media just like comedians treat comedy clubs. They do shows at the comedy clubs so they can develop their craft, test out their material, see whether or not the audience laughs. The comedy clubs are a smaller stage. They can’t test material in large arenas, it’s to late at that point. In fact, do you think they’d be able to fill large arenas if it weren’t for the small, dark, sweaty, smokey night clubs? Highly unlikely. Your small, dark, sweaty, smokey night club is your blog post and social media, namely Facebook since you can have longer posts in comparison to Twitter. If you bomb, fall flat, no one laughs, who will know? No one. What does that mean? Does it mean no one read it or does it mean they didn’t have anything else to add or does it mean you left no opening for them to comment on? Sure, it could mean what you posted totally sucked, but that’s the last possibility. And if they did think it sucked, praise Jesus they didn’t say it in the comments. Is it really a big deal that no one clicked "like" or commented on something you posted? It shouldn’t be. It’s your testing ground. It’s the place you’re working to perfect your craft before the large stage, the arena performance….your Webinar event! If our favorite comedians allowed performances that didn’t go so well to dictate the path for their career we wouldn’t know them. They would never get their shot because they would have already given up. And I know that’s not you, you’re not a quitter. If you were, you wouldn’t be this far along in the post. Any other reasons for not hosting your Webinar are all just excuses. Not knowing what technology to use – an excuse. Not having fast internet – an excuse. Not knowing what night to host your webinar on – an excuse. I understand the numbers game and the content issue, I get that. We all get tripped up on that. It won’t go away except knowing that everyone had to start somewhere and it applies to both your numbers and the content you bring to your community. In fact, your content facilitates the increase in your numbers. If you’re speaking to the wrong audience, your community numbers will not increase. Once you identify your right audience and start talking to them, you’re on to something, your numbers will increase. You may wonder, how will I know when you’ve got it right? Someone laughed. You got likes, shares, comments, repins. And when you find out, don’t be set on the number of digits. Remember that amount, is just the beginning. You continue adding content your community engages with and you’ll soon see, you can’t help but host a virtual event. Your community will practically push you into the large arena. You won’t be able to hold everyone in the small club. You’ll find yourself writing books instead of posts for your blog and social media posts. When that happens, it’s time! When you find yourself wanting to say more, but working hard to keep it brief, it’s time! It’s time to start hosting your Webinars! 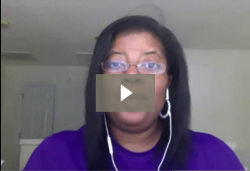 Before you jump in and start hosting Webinars, build your community. Use your blog and social media to develop your voice, refine your content, and build a group of amazing people who love what you have to offer. When you do, your numbers and content will no longer keep you from hosting your virtual events. You’ll still wonder if people will show up, however you’ll have a different perspective about those who show up versus those you don’t because you already know that what you have to offer is valuable according to your community. When you know something is really good and people will miss out if they don’t show, you don’t focus on the no-shows, you focus on those who are there and make sure they get everything you have to give and then some. Make it a FABULOUS one! Shout out to my favorite comedians Chris Rock and Kevin Hart who helped me understand how to develop your craft. Who knew?! Image courtesy of aweber at aweber.com, customized by moi!